From the GMC Sierra, to the Honda Prelude, all-wheel steering has been offered in many different vehicles of all shapes and sizes for the past few decades. While four-wheel steering is not a new concept in cars, it has seen a resurgence in the last few years. Four-wheel steering technology is beneficial because it increases the vehicle’s steering response time and helps keep the vehicle stable at higher speeds. With all four wheels steering, instead of only the front two, this technology offers unprecedented control and maneuverability. That being said 4 wheel steering takes some getting used to. 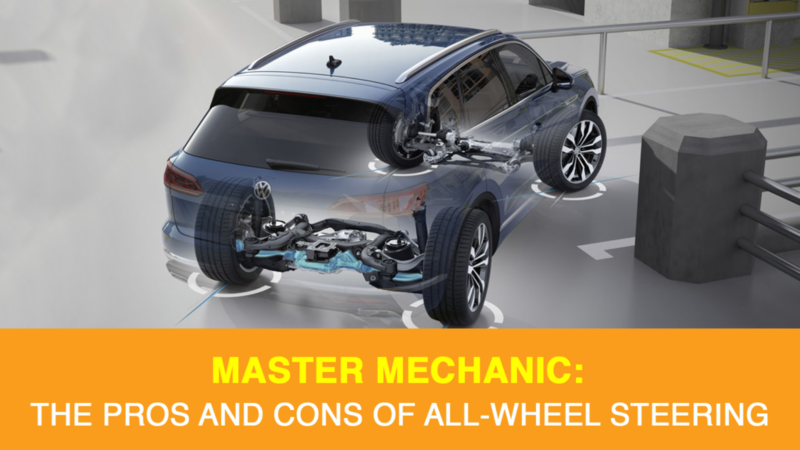 We caught up with a Master Mechanic to outline the main advantages and disadvantages of a four-wheel steering system. With four-wheel steering, your vehicle will undoubtedly respond faster when turning and switching lanes. More precise and controllable steering is safer for you, fellow drivers, and pedestrians. While it might not make a world of difference in everyday driving scenarios, it can when an unexpected obstacle is in your way. When the roads are wet or icy, some corners can be quite challenging. Four-wheel steering will help your car complete corner turns with stability and control. With all four wheels turning, you’re less likely to fishtail or get stuck. Four-wheel steering means all wheels steer. It doesn’t mean that they all have to turn the same way, though! When you’re able to turn the rear wheels in the opposite direction of your front wheels, this allows you to complete smaller circular turns at lower speeds. Canadian winters can be pretty brutal. We’re all aware of the benefits of four-wheel driving in the snow, but four-wheel steering can be equally helpful. If you’re stuck in a patch of snow or hit ice while driving, four-wheel steering can help you re-gain control more quickly potentially saving you from an accident, with accompanying repairs. No one like to see their vehicle on the back of a tow truck !! When you’re driving your vehicle on a straight road, four-wheel steering can still help. The system will give you the best stability imaginable and will let you handle potholes and high winds with minimal swaying. When you’re cruising on the highway and you need to change lanes quickly, all-wheel steering works like a dream. You can easily cross over without turning the wheel much at all and won’t need to accelerate as much to maintain your speed. As safe and useful as four-wheel steering systems can be, they also tend to be reserved for higher-end makes and models. They require a lot more components and calibration than traditional steering systems, and this carries an accompanying cost. For reference, if we look at the cars currently offering four-wheel steering. Audi, BMW, Lexus, Porsche, Lamborghini, Ferrari, Mercedes, and Acura all have car models that offer four-wheel steering. They’re all also Import vehicle manufacturers which tend to be more expensive to purchase and maintain overall. At Master Mechanic we want you to be aware of what you’re getting into. Since four-wheel steering systems have many mechanical and electrical components, if one malfunctions, your entire steering system could be compromised. Since they are more complex, four-wheel steering systems also tend to take more time to repair. While these costs may not be a deal breaker for a Ferrari driver, it’s something you’ll want to account for if it’s a car that is your daily driver. Should I Get Four-Wheel Steering? At Master Mechanic, we believe the features you add to your car should suit your driving habits. That said, four-wheel steering is a feature that can increase safety and maneuverability in your vehicle. If you have any questions about four-wheel steering or would like to book an appointment, contact your local Master Mechanic today. We’re always happy to help!